The shoreline at Stokes Bay is maintained by Gosport Borough Council in a partnership called the East Solent Coastline Partnership. The Eastern Solent Coastal Partnership (ESCP) formed an alliance in 2012 to deliver a combined, efficient and comprehensive coastal management service across the coastlines of four Local Authorities of Fareham Borough Council, Gosport Borough Council. Havant Borough Council and Portsmouth City Council. The overarching vision of the ESCP initiative is ‘to reduce the risk of coastal flooding and erosion to people, the developed and natural environment by encouraging the provision of technically, environmentally and economically sustainable coastal defence and protection measures’. A Shoreline Management Plan is a non-statutory policy document for coastal defence management planning. It takes account of other existing planning initiatives and legislative requirements, and is intended to inform wider strategic planning. It does not set policy for anything other than coastal defence management. The accepted plan for Stokes Bay, Titchfield Haven to Gilkicker, is ‘Hold The Line’. Under this plan, defence structures will need to be maintained and upgraded to provide flood protection to residential areas, commercial property, MOD assets, infrastructure (such as Stokes Bay Road), and amenity open space. In terms of beach management and recycling operations, the frontage is considered as a single management area and will benefit Hill Head, Lee-on-the-Solent and adjacent frontages, with possible beach recycling from Gilkicker Point. Coastal monitoring will be key to the successful management of this frontage. Undermining of the promenade due to Storm Katie. Scouring has removed the shingle from the beach leaving the foundations exposed and causing the frontage to lean towards the sea. Storm Katie, 27-28th March 2016, at Stokes Bay undermined the promenade in three places, causing voids that have left the promenade unsupported. The ESCP determined the best way of rectifying this, which involved filling the voids with concrete and moving shingle from areas of accretion to those areas that are affected by erosion. Work to correct some damage began July 2016. 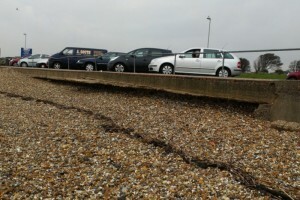 Long-term plans to protect the seawall from erosion in Gosport started in 2017 following a full investigation. 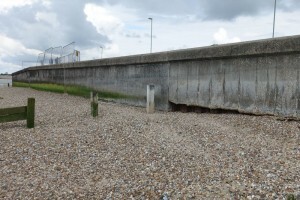 The Council’s coastal engineers at the Eastern Solent Coastal Partnership (ESCP) are responsible for the ongoing monitoring, maintenance and eventual replacement of Gosport’s sea defences. The reinforced concrete seawall and promenade constructed during the 1970’s has experienced several serious failures over recent years and is in a poor condition. Routine asset inspections have repeatedly identified areas of damaged concrete, internal voids or undermined foundations. 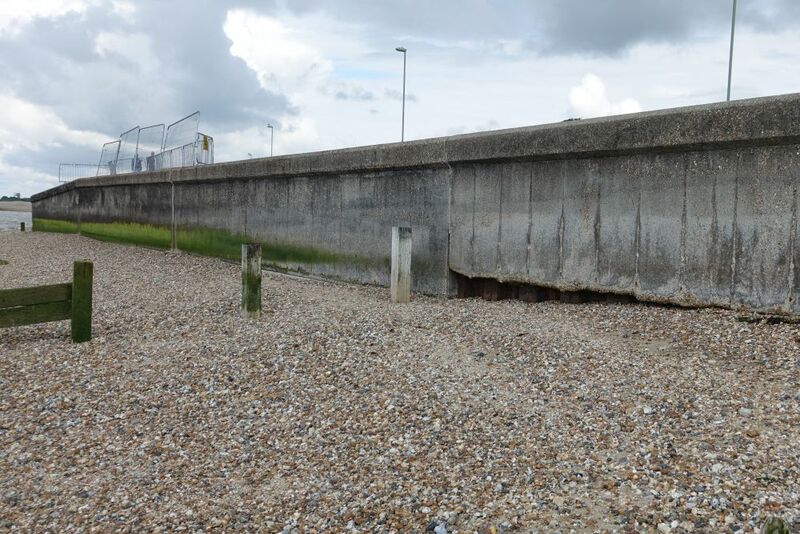 Recent geotechnical and intrusive investigation funded by Gosport Borough Council have shown these structures to have shallow foundations, and while the concrete is of good strength, the internal steel reinforcement is in a poor rusty condition. Sea defence damage and failures present an on-going and increasing risk to public safety, Stokes Bay Road, drainage and other infrastructure. The frontage has been divided into three sections (East, Central and West). 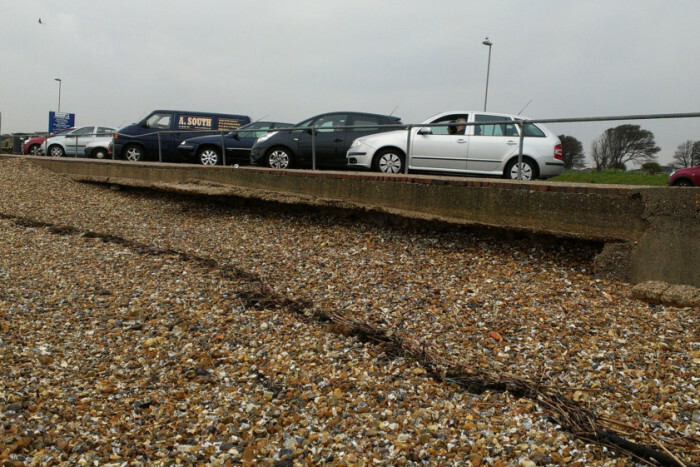 Stokes Bay East – While the majority of this 98m long low height seawall is in good condition, a 40m section is very poor. This section has a shallow foundation and is prone to damage when beach levels erode each winter. The most recent repair was undertaken here in March 2018 to infill a large void which formed because of undermining of the promenade following Storm Eleanor on the 4th January 2018. This resulted in the closure of the footpath adjacent to Alverbank East Car Park for 2 months prior to repair. Other failures occurred in 2015 and 2016. 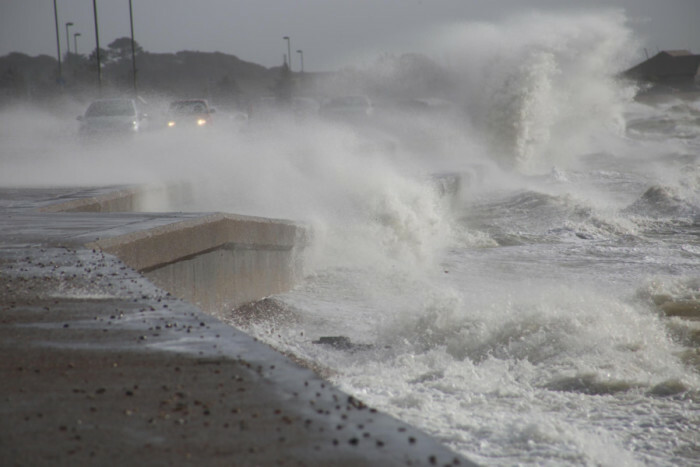 Stokes Bay Central – The double-height promenade is exposed to heavy wave overtopping during storms, which can cause damage to the lower promenade and wash out fill material from inside the structure. The structure has undergone numerous historical repairs, the most recent of which were undertaken in 2010, 2012 and 2014. A 15m section of wall is in a very poor condition and has rotated seaward. Regular monitoring undertaken by ESCP Officers has indicated no further movement since 2016, however it was considered necessary to install temporary crowd barrier fencing to prevent public access to the lower levels. This is now being replaced with a formal handrail in August 2018. Stokes Bay West – This low height seawall is in a fair condition and is afforded protection from the healthier beach levels at this locality. Minor repairs were required here in 2016 following Storm Katie, but the structure has otherwise remained stable and is of a lesser concern than the other frontages. The current situation is focused on a failure at Stokes Bay Central which would compromise the Stokes Bay Road, leading to a possible road closure. This would affect the services within the road and the Southern Water outfall at this location. The consequences of a failure at Stokes Bay East are less severe but would still lead to closure of the prom and a long-term diversion, with the risk of damage then spreading to the adjacent sections of seawall. The leading repair option for the 40m of damaged seawall at Stokes Bay East is to demolish and replace the existing seawall. At Stokes Bay Central it is proposed to buttress the 15m of damaged seawall with rock armour to stabilise and prevent collapse. These Phase 1 repair works will address the immediate concerns and provide time for longer term plans to be developed. The ESCP have prepared a Scoping Study, to further understand the long-term risks and opportunities for replacement sea defences in Stokes Bay. The study has reviewed land ownership, coastal processes, heritage and archaeology, defence condition and environmental constraints along the frontage. It recommends that a Feasibility Study be undertaken to develop the concept design for a long-term upgrade of these coastal defences. The budget costs associated with Phase 1 repair works would not be eligible for Environment Agency Grant-in-Aid-funding, and even if they were, they would still be a low priority as there are no households at direct risk of flooding or erosion. While Gosport Borough Council own these defences and have responsibilities for maintenance, financial contributions are being sought by the ESCP from the other beneficiaries of these assets; Hampshire Highways and Southern Water. The Phase 2 Feasibility Study costs would also be considered a low priority for Grant-in-Aid funding, therefore further contributions would be sought from the local beneficiaries. The ESCP are however preparing a Local Levy bid for the next funding round in October 2018, with the aim to commence the study in 2019/20 with a preferred design concept for consultation by the end of 2020/21. Further funding would be required for the detailed design of any upgrades and their construction costs. A communications plan is to be initiated before the end of August 2018 to update Councillors, residents and interested groups on the proposed approach via the ESCP webpage and signage. A permeant handrail is to be installed to the lower promenade by the end of August 2018 to restrict public access to the damaged section of wall, and areas at most risk of future damage. Phase 1 repairs to Stokes Bay Central are the most urgent to avoid the loss of the road and should be initiated as soon as funding and consents (an MMO license and Planning Consent) are in place for these works to proceed. The seawall replacement at Stokes Bay East is also urgent and could be delivered alongside the works at Stokes Bay Central. The ESCP are to engage with both Southern Water and Hampshire Highways to seek financial contributions from these beneficiaries towards the repairs and towards the recommended Feasibility Study. Their desire and ability to contribute is unclear at this time. Despite these urgent repairs, there remains a residual risk of a storm causing new defence failures along this frontage. ESCP Officers will continue to undertake regular inspections on a quarterly basis as well as post-storm events, to anticipate these.